"Gasoline stations were evident on many street corners in business districts, including this one at 564 Main Street, at the junction of North Avenue, Main Street and Nahant Street. In 1930, American Gasoline & Oil Co. advertised gasoline prices at $.15 per gallon, at their Wakefield 'filling station.' In 1934, the advertised prices dropped to $.13 per gallon with tax, and $.12 1/2 per gallon for American Anti-Knock. Their 2,000,000 gallon waterfront storage plant and cargo purchases made it possible to market at those prices. They also referred to themselves as 'American Gasolene'. They took pride in the fact that their 'prompt and courteous attendants' took care of tires, put water in the radiators, and put 'real distilled water' in customer's batteries. Their price for a quart of American Paraffin Base Oil was $.20 for medium and heavy, and $.25 for extra-heavy. The company also operated three stations in other communities, including Salem Street in Reading, Main Street in Wilmington, and Revere Parkway in Everett." -- Text from calendar by Jayne M. D'Onofrio. 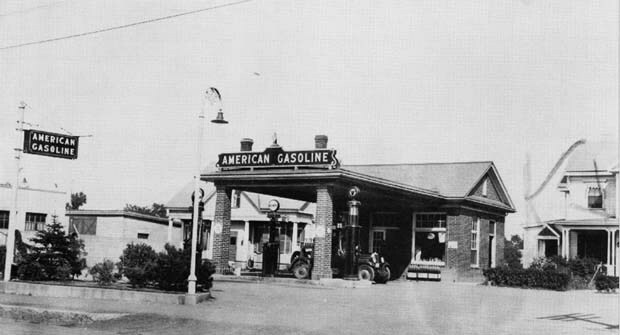 “American Gasoline & Oil, Co., Wakefield Junction, 1931,” NOBLE Digital Heritage, accessed April 22, 2019, https://digitalheritage.noblenet.org/noble/items/show/6863.